Registered in the Ministry of Public Health of Ukraine. ISO 9001, 13485 CE Mark. Our company exclusively supplies kits and consumables for electrophoresis on cellulose acetate from Italian manufacturer CELL Start Project. We can sell goods as a complete kit, or by the individual components: Cellulose acetate membranes, concentrated buffers, ready dyes, controls, additional reagents. 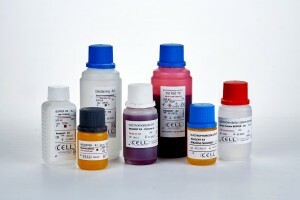 These supplies provide high quality analysis, are stable and economical. There are in stock and on order. Kits are suitable for semi-automatic electrophoresis analyzers type FORESСAN-001, Meander (Ukraine), the UEF-01, ASTRA (Russia) and other similar.